Conservation of Cultural and Environmental Heritage, Rome, 1999 May. This paper reports NDT by Electro-optic Holography and IR Thermography on a sample reproducing a wall fresco. In particular, the location of artificial defects contained inside the fresco and the evaluation of their dimensions are examined. An important feature is also the classification of different kinds of defects. The experimental and data processing procedures are described for both methods. In recent decades interferometric methods are increasingly being applied as diagnostic tools in the artwork conservation field. Infrared thermography is also widely applied in non-destructive diagnostics. Discontinuities or anomalous regions are located by differences in temperature. For the Thermal Method, a mathematical simulation of the thermal problem allows to predict thermal stresses and a better designing of the test. Automatic processing of data is presented giving outputs very simple to understand. One of the most important technical problems in ensuring the long-term conservation of cultural heritage is checking of its conditions. Wall paintings in buildings and monuments of historical interest interacting with the environment are modified over time. Air pollutants lead to biological and chemical processes, which, in conjunction with some atmospheric physical parameters, cause the decay. Knowledge of the behaviour of the structure supporting the painting under thermal stress or humidity variations might help to understand how these factors affect the deterioration of an artefact. Wall frescoes are especially sensitive to temperature and humidity variations. Temperature and humidity act as shearing forces between layers or portions of a wall, weakening the material during the numerous cycles of these forces and causing the appearance of microcracks, debonds or anomalous strains on the surface, finally resulting in the decay of the artworks. A correct approach to artworks conservation requires the identification of defects at an incipient stage. In fact, the comprehensive measures taken to protect and conserve the artworks and to restore them as necessary, can give positive results only if experimental methods are available for detecting the state of preservation, locating the flaws and determining their characteristics. In recent decades interferometric methods are increasingly being applied as diagnostic tools in the artwork conservation field [1, 2, 3]. Infrared thermography is also widely applied in non-destructive diagnostics [4, 5]. As a matter of fact, one of the major problems in IR detection is the difficulty in reading correctly fuzzy images. In these cases, interferometric optical techniques can help to gain a correct analysis of the object under test. In this work, we propose to integrate the thermographic inspection of frescoes with an inspection by electro-optic holography. The obtained data can be used, together with results coming from different techniques, to help the conservation specialist to gain an objective overview of the artwork conditions. Thermal modelling is particularly useful in order to predict effects of extreme environment conditions. Here, it is used to properly design the test of the fresco by thermography. This task is essential because of the transitory nature of the adopted technique, requiring the a priori set-up of important parameters as the impinging energy and the test duration. We first observe that some researches in art conservation are of a rather general nature. They refer, for example, to the study of the behaviour of typical materials used in artworks or in restoration, say marble, wood, canvas, under the action of chemical or biological agents as well as mechanical or thermal stresses. Very often, the modifications induced in these materials by the applied agent finally lead to morphological changes of the specimen under test. In these cases, holographic and speckle interferometry can be used as a tool for detecting such changes. Figure 1: (a) support wall; (b) mortar; (d) pictorial layer. Frescoes (and wooden panels) are artifacts particularly suitable for optical techniques testing. In fact a painting on a wall can be considered as a layered structure with a support (see figure 1). The most important structural defects are also shown. The support wall is coated with plasters, which serve as a base for the painting. These layers are less thick and more fragile than the support. Expansion and contraction of the support due to daily fluctuations of ambient parameters can produce large strains and eventually cracks in the layers, as they become less flexible with age. Furthermore, abrupt changes of temperature and humidity, traffic induced vibrations, and heat exposure may also cause unpredictable stress distributions in the heterogeneous materials of the support with consequent damage of the painted surface. All these mechanisms may lead to the formation of detachment and cracks which are very common in wall and wooden paintings. For conservation purposes the knowledge of incipient and invisible flaws and of the artefact deformation caused by ambient drifts is very important, as well as the understanding of how the presence of the support cracks or discontinuities alter the movements of the painted surface. To compare the diagnostic techniques, a model, simulating a fresco on an ancient wall, was realised. The ingredients of the model are Portland cement and sand with sufficient water added to give the required water-cement ratio. The aggregate inserted into the paste during the moulding process consists of pieces of old bricks (see figure 1a). 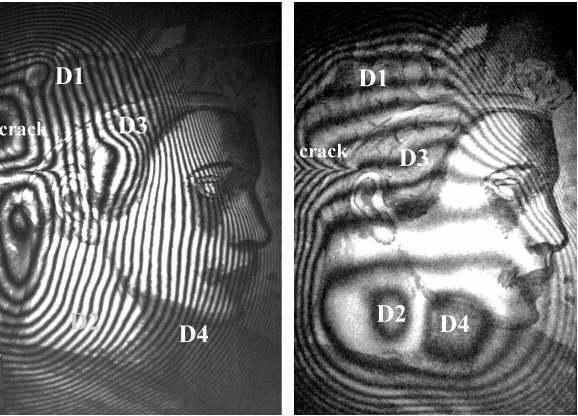 After artificial ageing, a visible crack appears (see figure 1a). In the mortar layer (see figure 1b) artificial voids were inserted. Finally, before painting, two other defects were simulated by inserting two little sponges. Figure 1d shows the final fresco model with the indication of the simulated defects. The dimension of the model are approximately 27 ( 41 cm2. The principle of the standard electro-optic holography or electronic speckle pattern interferometry (ESPI) technique is well known in engineering measurements [6,7]. The ESPI was developed in the early 1970's as a method of producing interferometric data without using traditional holographic techniques. It is possible to describe ESPI as an image holography (an image hologram is recorded of a real image of the object instead of the object itself), with an in-line reference beam, where the TV target has replaced film as recording medium. Obviously, the photosensor of the TV camera is not suitable for optical reconstruction of the hologram, therefore the reconstruction process is performed electronically and visualized on a monitor. The image interferogram is converted into a corresponding video signal by the scanning action of a video camera. This video signal is electronically processed, through an intermediate recording medium (commonly a frame grabber), before being displayed on a TV screen, so that the variations in the texture of the speckles are converted into a variation of brightness. This image is entirely equivalent to a holographic reconstructed image and possesses the same interferometric sensitivity. 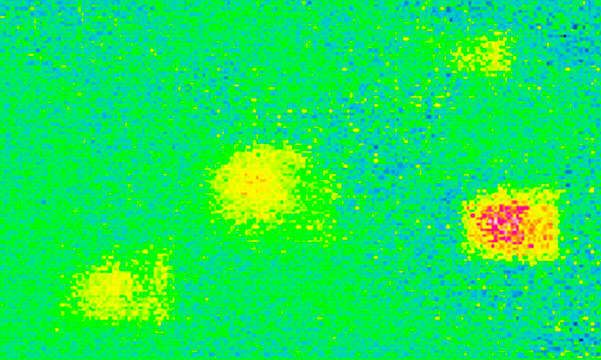 Any deformation of the object under test changes the distribution of the speckles; two consecutive holographic speckle patterns combined together will generate correlation fringes corresponding to the deformation field. These correlation fringes, in which each fringe represents a line of constant displacement, can be displayed in real-time as the object is deformed. With a PC based image processing the video signal with the object in an initial position can be digitized, processed and stored in a reference frame. After deformation, the new stored pattern can be subtracted from the initial pattern, and the squared difference can be displayed on a video monitor as real-time fringes. Because of its extreme sensitivity to surface deformation, ESPI interferometry can be used to gain meaningful information with regard to the structural characteristics of an object, by observing the surface movement produced when it is subjected to a stressing force. As such, it offers the potential for many nondestructive inspections wherein the parameter of interest (e.g., cracks, voids, debonds, delaminations) can be made manifest as discontinuities in surface displacement. The discontinuities appear as anomalies in an otherwise regular interferometric fringe pattern and hence enable the region of fault to be identified . Furthermore, to obtain a good quality interference pattern, the ESPI system as well as the surrounding environment must remain stable, during the exposure time, to at least l/8 . Any relative motion of the order of the laser wavelength between the optical system and the object under investigation introduces unwanted fringes, which inevitably, alter the results. In particular, during in-field operation, the presence of mechanical vibrations is the major source of uncontrollable micro movements, which might have destructive effects on the measurements. When vibrations influence the interferometric system, the deformation fringes become barely visible, as they are no longer stable. Consequently, any attempt to record the fringe pattern leads to very poor results. In the optical laboratories, these problems can be solved by use of massive tables, whose design is based on drastic reduction of the structure resonance peaks. It is evident that heavy and bulky tables do not comply with the portability of an optical system and its in-field operation. An alternative solution can be chosen for the tests in situ. It is possible to assemble the video camera and the fiber ends in an optical head mounted on a tripod. This arrangement seemed to provide the best flexibility. The tripod system, on the other hand, has to be as insensitive as possible to external vibrations. In a church, a museum or a conservation laboratory, floor resonance (5 to 50 Hz) and street traffic (5 to 100 Hz) are the main source of micro vibrations. In general, in non-industrial environments, the common sources of mechanical instability have frequencies below 150 Hz. Therefore, if the measuring system has a resonance frequency greater than this value, vibration effects will be greatly reduced. Residual relative rigid displacements between the object and optical head will reduce the fringe contrast, which can be recovered by digital image enhancement techniques . Because of the subtraction nature of ESPI measurements, the interferograms contain no visible details of the object. As the restorers need to know the exact location of the defects on the artwork, digital techniques can be used to solve this problem. It is possible, before realizing the ESPI interferogram, to capture the details of the object by illuminating the object itself with incoherent light. This capture must be realized by the TV camera of the ESPI system, located in the same position that will be used to record the speckle pattern. Subsequently, by edge-detection processing, it is possible to obtain the edge map of the object under investigation. To check the system, tests were made on the model simulating a wall fresco. The existence of ambient drifts suggests that ESPI techniques can be used without further stress application. However, the sensitivity of this procedure is rather poor. The sensitivity can be increased by producing some kind of stress that acts directly on the surface layers, for example surface heating through application of infrared radiation. Due to the lack of adhesion, the detached regions disperse heat at a lower rate than the surrounding regions. Therefore, both the local temperature rise and the thermal expansion effects are higher for the detached regions. An ESPI interferogram can be made during the heating process or during the following cooling process. In this work, the stress was induced by heating the model with two 150 W infrared lamps, at a distance of approximately 1 m, for 45 s. This heating produces a surface temperature variation of about 3 °C. 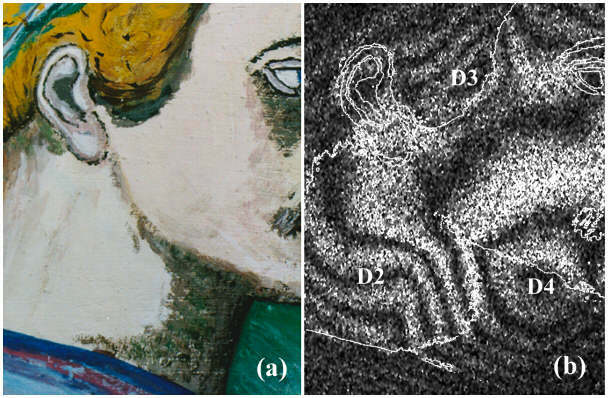 Figure 2: (a) detail of fresco model; (b) ESPI Interferogram. Figure 3: double-exposure hologram of fresco model. Figure 2a shows a detail of the model while in Figure 2b is shown the ESPI interferogram, relative to the region of Figure 2a, with digital addition of its edge map. In this way is obtained an exact localization of the position of the defects. From the analysis of the structure of the fringe pattern four defects are found out. The defects D3 and D4 are located in the two zones that present closed fringes. While the D3 defect is located by the anomalous curving of the fringes. For most applications only a qualitative interpretation of the correlation fringes is required. However, for particular studies of the stress methods or of calibration experiments effected on models simulating panel paintings and frescoes with the most common defects, a quantitative interpretation is also possible . 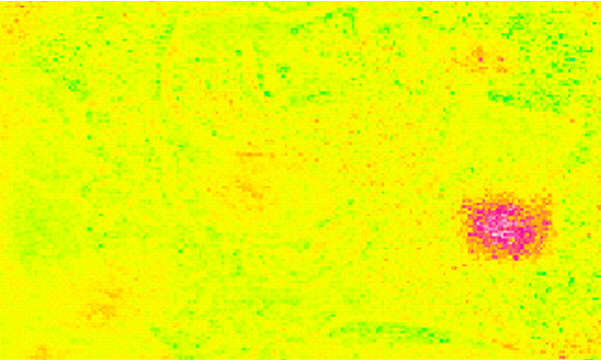 In Figure 3 are shown two double-exposure holographic interferograms, obtained with similar stress used for ESPI. The four defects, present in the model, are clearly visible. Besides it is pointed out the presence of the crack, in the support wall, made up during the realisation of the model. Thermography is a very useful diagnostic method, as it is related on a characteristic of all bodies: their temperature. The practical application of thermography for the non-destructive testing (NDT) involves the evaluation of surface thermal patterns. In fact, temperature varying in space and time may reveal discontinuities beneath the surface, moisture growth, corrosion in metals or other kinds of defects. The plaster detachment from a massive wall or within a fresco generates a void containing air. Because air has insulating properties, the presence of the discontinuity modifies the heat flow. From surface temperature map, defects location is possible, once material properties and boundary conditions are roughly known or uniform everywhere. Generally, because of the complexity of fresco in historical buildings and climatic conditions, reading a thermogram is sometime difficult [4, 5]. A significant increasing of the test reliability has been achieved in industry using transient, active techniques . Even if, utilising thermography for NDT on works of art is more difficult than in other applications. Different techniques are now available for thermal NDT. They use various thermal stimuli and data processing , but in their nature all consider the temperature behaviour in time (or frequency) less affected by "noise" than amplitude. The nature and geometry of the defect can be estimated using a technique known as Thermal Tomography . The transient inspection is performed on a single face of the fresco, therefore only a shallow layer is heated. On the contrary, a steady procedure requires a temperature gradient is applied to the whole wall. A typical experiment involves heating the test object and recording a sequence of IR images to follow the time evolution of temperature in a particular surface element. Because defects affect the imposed heat flux, due to their higher thermal resistance, the resulting surface temperature pattern allows identifying discontinuities in depth. The temperature difference between a sound zone, taken as reference and a defected area represents the thermal signal. This signal is then normalised in order to reduce effects of the heating unevenness, giving the thermal contrast . Therefore, starting from a sequence of thermal images, the thermal contrast of any pixel is plotted in time. The maximum of the contrast of each pixel and the time of its occurrence are recorded in two new images, that is: maxigram and timegram. This procedure enhances the defects visibility if compared with the raw thermogram and could be in some extent automated. There is much to discuss about the optimisation of the heating function . In this experiment, a long pulse of constant intensity is adopted. Starting from the time when the heat source is turned on, temperature signal over a defect will increase, reaching its maximum value at a particular instant. An optimum observation time (tm) exists, roughly dependent on defect depth. In general, the deeper the defect, the longer is tm. Of course, it also depends on the thermal diffusivity of the plaster. In order to define parameters of the test in transient state, some preliminary mathematical simulations have been performed. A numerical model has been implemented in a dedicated package . The program calculates temperature evolution in time over defects and sound zone. For this computation we assumed to know approximately the depth of defects (around 3 and 10 mm) that is at interfaces between the plaster, the mortar (see Figure 1) and the mural support. Defects have been simulated in cylindrical co-ordinates with an air-filled disk-shaped volume. As minimum diameter of interest was set 30 mm for deeper defects; 30 and 10 mm for shallower (see tab.1). Thickness has been limited as 2 mm or 10 mm for the deepest void. Repeating computations for different heating period, lasting for 20, up to 50 s, we chosen the amount of energy to deliver on the surface, the test duration and the grabbing step. Figure 4a: Temperature vs. time computed for 3 air filled voids: depth 10 mm, size 30 mm; depth 3 mm, size 30 mm and depth 3 mm, size 10 mm (heating 3.5 kW, 50 s). Figure 4b: Thermal Contrast (TC) vs. time computed for the three defects of Table 1 (heating 3.5 kW, 50 s). In figure 4a it is shown the surface temperature history due to a constant heating of 3.5 kW per 50 s. The temperature vs. time is shown for the sound material and for the three defects described in tab.1. The figure 4b reports the thermal contrast for the same defects. The maximum of the contrast happens in the range 60-80 s for the shallower defects and at around 320 s for the deepest one. The different behaviour of the defects is mainly due to the depth varying. It is worth noticing that also the extension of the defect is a crucial factor. In fact D 3-30 and D 3-10 differs only for this, but the larger one shows a much higher contrast. When the ratio between depth and radius is higher than a certain value (mainly depending on thermal diffusivity of the bulk material) a 1D heat flux could be assumed. This assumption strongly simplifies the thermal problem and allows using of a much faster analytical solution. In such a case the central area of defect is affected by a 1D heat flux, otherwise the 2D heat flux, acts not only around edges but on the whole. Table 1: Geometry of simulated defects used in computation. A transient test could be applied delivering radiant heat flux onto the external wall from a suitable heat source. Thermal NDT in this experiment was performed heating the sample by means of a bank of 16 IR tubes. An Agema 900 LW thermographic equipment has been acquiring a sequence of 150 thermal images, at a sampling time of 10 s.
Figure 5a: Thermogram of the sample, taken at maximum heating, that is 50 s after lamps were switched on. 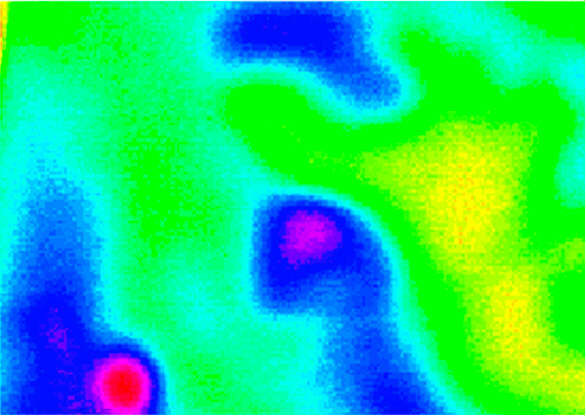 Figure 5b: Thermogram at the optimum time for D 3-30 defect visibility (100 s). Figure 5c: Map of maximum contrast (maxigram). Figure 5d: Map of time of maximum contrast (timegram). The thermogram of Figure 5a was taken at 50 s since the heating started. This is the maximum of the temperature and a clear image of the painting is visible due to different absorbing coefficient of colours. This is a very hard problem because normalised contrast reduces this effect but not get rid of it. The reason is the heat flux parallel to the surface deriving from the surface temperature gradient. This flux increases during the test temperatures at lighter colours, close to colour edges and creates many false alarms . Figure 5b shows the thermogram taken at the optimum time for visibility of defect D 3-30. To enhance defect visibility, the temperature history of any point is compared with a reference area, chosen on a sound zone. Thermal Tomography characterises the defect, using proper calibration functions. According to this, a window in time evolution corresponds to a layer in depth. This allows separating the searched defect from the whole structure. In figure 5c and 5d Maxigram and Timegram images are reported. These pictures clearly indicate positions of four defects. Classification of depth according to Thermal Tomography could be misleading, if only amplitude of maximum is considered. For instance D2 is indicated by the highest maximum value. 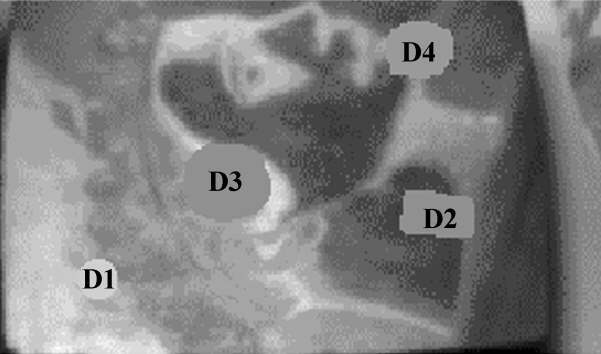 Analysing contrast profiles in time, as reported in figure 6, we found the depth of D2, higher than D1 and D4, because of its delayed maximum contrast. Figure 6: Temperature vs. time and Thermal Contrast for 3 defects located as in fig. 6b. The Figure 6 shows the experimental temperature profiles of 3 defected zones and a reference point. On the right scale the thermal contrast profile could be read for three of the four defects detected in the sample. It is clearly seen that the three defects D1, D2, D3 give a strong signal. The maximum of D1 (upper left corner of the thermogram) is reached approximately at 70 s. The others defects show a maximum much later, indicating a greater depth. On the basis of the good agreement with results of simulation the corresponding depth is estimated in 3 and 10 mm respectively. In addition, numerical simulation indicates as correct the hypothesis of 1D heat flux for all defects. Because a defect so shallow as D1 must have a more pronounced maximum, probably its thermal conductivity is higher than air. The characterisation of the detected delaminations is reported in Table 2. Table 2: Placement of defects found in the test. Figure 7: Detection of defects using time integration algorithm. 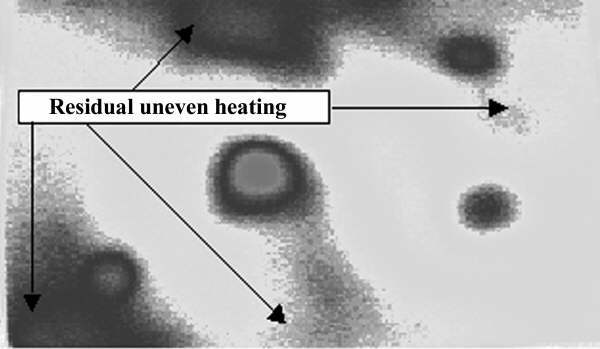 Figure 8: Detection of defects on fresco using artificial thermal stimulus; 4 defects are classified, labelled and superimposed to maximum heating thermogram. Another algorithm has been applied to a different test, where the sample was heated for 30 s. Figure 7 reports results of the integration of thermograms from 550 up to 900 s, normalised by the integral of thermograms in between 450 and 550 s . Here, some areas are affected by a residual higher heating due to their darker colours. Figure 8 shows the result of the test according to a very simple and effective procedure driven by an operator. Location of the four classified defects (see tab.2) has been superimposed on the thermogram taken at maximum heating. The size of defects has been evaluated on the areas segmented by means of the histogram. Mural frescoes are very important in artwork conservation. In this work we investigated the possibility of using electro-optic holography and IR thermography to diagnose the conservation state of frescoes. Our results show that Thermal Tomography in time domain is more reliable than in amplitude. In fact, the underlying idea to separate defects existing inside a defined layer of the material from the whole structure, greatly reduce false alarms. Another advantage of this approach is the minor influence of the surface uneven heating. The simulation of the thermal process is very effective. Comparing the experimental results with simulations, a satisfying agreement for the expected time of the maximum signal emerges. A difference on the amplitude of the thermal signal is also encountered. At the same time the disturbance, due to colours creates an uneven heating of the surface. This is the main obstacle to a better performance of the technique. Electro-optic holographic techniques are able to identify the defects as well as IR thermography. Generally, optical techniques require skilled operators and a correct reading of the results is complex. However the sensitivity is high, therefore the required thermal stress is much lower than in IR thermography. For the future, both more sophisticated algorithms to analyse interferograms and thermograms, based on artificial intelligence and different thermal stimulation procedures are under examination and testing. The present work was suggested and partially founded by the "Progetto Finalizzato Beni Culturali" of the Consiglio Nazionale delle Ricerche. 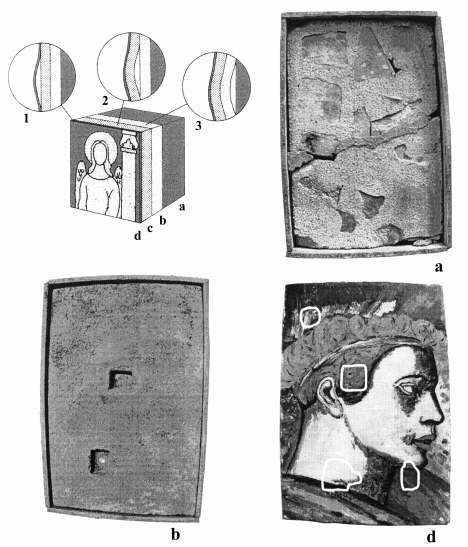 Paoletti D, Schirripa Spagnolo G, The potential of portable TV holography for examining frescoes in situ, Studies in Conservation 40, 127-132, (1995). Paoletti D, Schirripa Spagnolo G, Interferometric methods for artwork diagnostics, Progress in Optics vol. XXXV, ed. by E. Wolf, (North Holland, Amsterdam), 197-255, (1996). Schirripa Spagnolo G, Electronic speckle pattern interferometry: an aid in cultural heritage protection, Trends in Optics vol. 3, ed. by A. Consortini (Academic Press, San Diego), 299-326 (1996). Schickert G., Infrared thermography as a possible tool to detect damaged areas in buildings, Durability of Buildings Materials 3, 87-99, (1985). Grinzato E, Bison P G, Bressan C, Marinetti S, Vavilov V, Active thermal testing of delaminations in fresco's plaster, 4th International Conference on Non-Destructive Testing of Works of Art, 357-366, (1994). Lokberg O J, Electronic Speckle Pattern Interferometry, Phys. Technol. 11, 16-22 (1980). Jones R and Wykes C, Holographic and Speckle Interferometry 2nd ed. (Cambridge University Press, Cambridge 1989). Tyrer J R, Critical review of recent developments in electronic speckle pattern interferometry, Holographic Non Destructive Testing, Proc. SPIE 604, 95-111 (1986). Schirripa Spagnolo G, Ambrosini D and Guattari G, Electro-optic holography system and digital image processing for in situ analysis of microclimate variation on artworks, J. Opt. 28, 99-106 (1997). Kreis T, Holographic Interferometry (Akademie Verlag, Berlin 1996).
] Maldague X, Nondestructive Evaluation of Materials by Infrared Thermography (Springer-Verlag, London, 1993). Grinzato E, Stato dell'arte sulle tecniche termografiche per il controllo non distruttivo e principali applicazioni, Conferenza Nazionale AIPnD, Padova, 130-152, (1997) (relazione speciale publicata sul "giornale delle Prove non Distruttive Monitoraggio Diagnostica pp.25-40). Vavilov V, Bison P G, Bressan C, Grinzato E, Marinetti S, Some New Ideas in Dynamic Thermal Tomography, Proc. Eurotherm Seminar #27 "Quant. Infrared Thermography - QIRT 92", 259-265, Chatenay-Malabry (France), July 7-9, 1992. Grinzato E, Bison P G, Marinetti S, Vavilov V, Non-destructive evaluation of delaminations in fresco plaster using Transient Infrared Thermography, Research in Nondestructive Evaluation 5, 257-271 (Springer-Verlag, New York 1994). Grinzato E, Vavilov V, Bison P G, Marinetti S, Bressan C, Methodology of processing experimental data in Transient Thermal NDT, Thermosense XVII°, Orlando (USA), 167-178 (1995). Vavilov V, Kourtenkov D G, Grinzato E, Bison P G, Marinetti S, Bressan C, Inversion of experimental data and thermal tomography using Thermo.Heat and termidge software, Eurotherm Seminar n. 42, QIRT 94, 273-278, Sorrento (Italy) (1994). Bison P G, Grinzato E, Marinetti S, Braggiotti A, Fresco thermographic inspection by convective heating technique, Review of Progress in Quantitative Non-Destructive Evaluation 17, ed. by D O Thompson and D E Chimenti (Plenum Press, New York), 1769-1776 (1998). Braggiotti A, Marinetti S, An adaptive technique for background removal in D2D, III Int. Workshop- Advances in Signal Processing for NDE of Materials, ed. by X Maldague ASNT Inc., Columbus (OH), (1998).